Books are human’s biggest boons. I respect people who read a lot of books, especially those who don’t just stop at remembering ad recalling what they read and go deep and research what they read, find meanings that have been hidden by the simpler sentences. This great epic first narrated by legendary Krishna Dwaipayana Vyas (aka Ved Vyas) is a master piece which is not less a than a text for any writer. Almost every writer wants to represent his/her interpretation of Mahabharat (or its part) some day. Here are some of the retelling/adaptations we came across recently. Late Harilal Upadhyay (a Gujarati author) have tried to stick to the original popular version of Mahabharat in his Mahabharat book series which is comprised of 7 books. Well known mythologist Devdutt Pattanaik came up with Jaya which is an illustrated retelling of Mahabharata where he tried to take a note of some of the less known tales from the epic. Deepak Kaul have tried retelling the Mahabharata as a comic book named Corpokshetra, where the characters are setup in current time. Prem Panciker tried to explore Mahabharata from Bhimsen’s point of view in his book Bhimsen. Author Christopher C. Doyle has tried it to setup in modern environment where traces leads to the original epic’s time in his The Mahabharata Quest series. 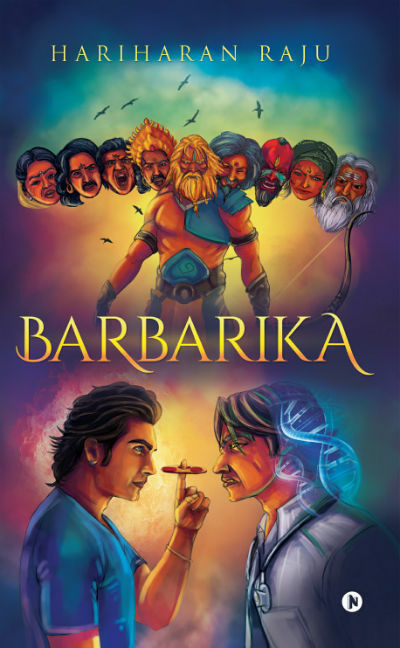 Recently we came across a book named Barbarika by debutante author Hariharan Raju. Fortunately, the book is available for free (at the time of writing this article) – Kindle Edition – and we grab the opportunity 🙂 . Fortunately, I got a chance to read and review it from our team and here are my unbiased views and review for this book. Let us start with the cover page of this book. As you can see, the cover page is designed using attractive and cheerful colors. It rather looks like a high-resolution poster of an animated movie. The cover page will surely remind you of “Vishwaroop Darshan” by Lord Krishna in Mahabharata. And, it goes perfectly in sync with the story. Also, the modern incarnation of Krishna holding the Sudarshan Chakra looking into the eyes of a man is something interesting. Again, you can find the roots of this illustration in the story. The story of the book is explored in three different time segments. I will try to make the briefing about the plot and review both as much spoiler-free as much possible, but, please read with consent that some of them might be there. The story starts from the time of Mahabharata. We know a lot about the Pandavas. Physically mightiest of them, Bhima, like his fellow brothers, was married to other women in addition to Draupadi. Hidimba was the first wife of Bhima. The union of Bhima and Hidimba resulted in the birth of Ghatokacha. Ghatokacha was a mighty warrior and his role in the battle of Mahabharata was nothing less than a game changer. Ghatotkacha was married to Ahlavati, a Yadava princess and they were blessed with a son named Barbarika. It is also said that Ghatokacha has another son named Meghavarna as well. Barbarika, the grandson of Bhima and son of Ghatokacha, has earned boons from the Goddess Durga herself, which made him the mightiest of all the warriors who took part in the battle of Mahabharata! What were the boons? How he achieved them? And, then, why don’t we hear much about him in Mahabharata battle? Cut to time segment 2, Roop Singh Chauhan was ruling the Khatu Kingdom. He and his wife Sukhibi was blessed with a son named Prithviraj. The circumstances turn and we see they have decided to build a temple in their kingdom. Whose temple was that? And, why they decided to build it? We meet many characters like Balaram (cow), Hameshi (Pujari), Marsha (villager) and others during the tale. Cut to time segment 3, on the day of 18 February, 1993, a boy named Shyam was born! He was an heir of a business tycoon who belongs to the royal lineage. He and his cousin Balram were almost inseparable. How he meets with a strange fate is explored in this segment. And yes, we got to know about Ashoka’s 9 unknown men, Radhagupta ( and his expertise in Biogenetics ), Vishaka and many other characters. And, yes Shyam was also on the quest of finding true love. Seems a complex and intriguing story, right? It is indeed. When you have so many questions in your mind (like now), you shall go ahead and read the book 🙂 . The book, of course, re-tells a fraction of Mahabharata, but it ends it there. It then weaves the traces of the same fraction in a thriller set up in the modern time. Of course, to jump from the Mahabharata time to the modern time, it takes little rest in the recent (comparatively) historical time as well. The reference of Thiruvalluvar, the famous poet, in the preface made us delighted. The book tries to become a Sci-Fi rather than just being a “mythology retold”. And, that is the beauty of the book. The preface of the book is written by K. Bhagyaraj who is known for his work in south Indian cinema. The foreword of the book raises expectations about the book. The science is infused in the story interestingly. So, there are talks about DNA, mutation and other stuff. However, the author’s main focus is on the entertainment and thrilling quotient of the story. Of course, we cannot expect science to be explored in the book beyond a certain extent, otherwise, some readers may feel it a little boring. So for a normal reader, it is a perfect mixture of the elements needed in a thriller. In that terms, the book is like a commercial film. As the author himself considers Eklavya who learned a lot from the movies of his Dronacharya (K. Bhagyaraj), the narration style reflects the same. It is more like a script of a film, and it hooks the reader with the book. The author seems to have a fantastic career ahead as an author and eventually he may try his luck in writing scripts for film. No story can keep the readers glued if it hasn’t a substance within. This book has a fantastic story to tell. And more importantly, the characters are strong enough. Usually, it happens that in order to glorify the hero(es) the writer focuses more on him/her. But, actually, more stronger the villain is, the hero appears even better. This story has multiple heroes and they all are explored pretty well. The book starts when Barbarika was 14 years old and it was his big day. The days starts with a simple yet important conversation. “What time is it Ma?” He asked yawning, stretching which still lying down. You must use your power only for good. It is simple yet effective, right? His eyelids felt like they were made of lead, dropping down by themselves. … No matter how much time paseed, the cow was nowhere to be seen. Marsha grew frantic with worry for his favorite cow. To him, she was like a mother, who took care of all his needs. Just how a son is helpless and defenceless when young without the mother, he felt naked and defenceless without Balram. King Ashoka felt that if normal men were given all the knowledge they would it for devastation and destruction instead of for peace. He helped the young prince to understand that it is what is inside that make sa human being good or evil. Remember that power by itself uncontrolled is chaos, and can harm just as much as it can help. Choose to use it for the right causes. Perhaps being challenged by the same gender was a bigger blow to their masculinity than treating a woman with respect. From these quotes you might have got an idea of the literary quality of the book. Of course, there are many points/quotes I need to avoid, in order to make it spoiler free. But, these should be good enough. The book doesn’t have any “adult only” material, making it a good read for the readers of almost any age group. Of course, there are points which could have been better elaborated. For example, if Barbarika was died young, how his direct descendants appear? The book has some spelling/grammar mistakes which could have been rectified at proof reading stage. I’ve read the kindle version of the book, so I will refer them with the location (rather than the page number). This line could have been written better. Modern day and age are such that not even the king was secure. Here “was secure” is written, while in that context “is secure” is required. On location 455 “critical men” is written, which is wrong (in the context). It is that boy who will be born on the 18th of Falgun much later on in your line…. Now, we need to remember there is no 18th day in month. Actually, Hindu calendar months are divided into two segments, Shukla Paksha and Krishna Paksha. So If the author possibly seems to refer 3rd day of Krishna Paksha. If you verify calendar of February 1993 calendar you will see that it was indeed Falgun month of Hindu calendar running those days. But the date of the Gregorian Calendar and the day of Hindu calendar doesn’t have the link expected. Of course, it is a work of fiction, but, for such thrillers, such points matter, as far as my views are concerned. The book is a nice read. If you love reading sci-fi mixed with mythology and if thrillers interest you, it is highly recommended read. The author and the book both have a potential. If the book is marketed properly and got the attention of worthy readers, it has all the elements of being the bestseller. We would love to give it around 8.5 stars out of 10.